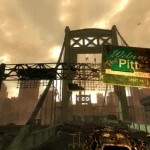 Today was the big release of Fallout 3’s second expansion, ‘The Pitt’. However, after just a few short hours this highly anticipated DLC is being taken off of Xbox Live due to widespread reports of file corruption. We will follow this story and report any further updates as they become available. so ok now that ive downloaded it and had problems with it and now i find out theres something wrong with it do i get a refund or am i screwed?